Portable baseboard heaters are an ingenious method of supplementing traditional heating sources inside of your home. They easily sit on the floor, against a baseboard, and heat the air that is against the floor. This heated air will rise from the floor, circulating throughout your home, and through the process of convection push all of the cold air back down to the floor. This is a cycle, and the baseboard heaters then heat up this cold air that has been pushed down. In general, these are pretty inexpensive options- most of them are easy to install, with many reviewers saying that it makes sense to install them near windows where cold air can begin leaking in during the winter months (Source). They are safe to sit on your carpeting, as well, because they come equipped with circuit breakers designed to prevent them from overheating. One interesting option is the US-made Farenheat baseboard heater- one buyer says that he lacks central heating in his home, so he purchased a couple of them to install in his children's bedrooms. He says that they are excellent- they don't get hot at all so he doesn't worry about his children getting burned from them. They are also fairly easy to operate- and he says that he unplugs them whenever he goes to work, just to be safe. This is a fan-less option so it is pretty quiet, though one user does say it will do some creaking as it heats up. This noise occurs as the heating elements begins working, and the heater expands and contracts- though reviewers say this is not a dealbreaker for them. Another buyer says that he went so far as to use a power monitor to assess the wattage of this baseboard heater, saying that it is exactly as the manufacturers described. 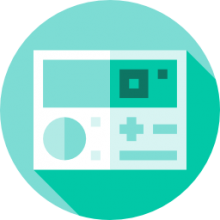 As well, the thermostat is highly accurate, the same user reports. Another reviewer was pleased that this is a USA-made product, which was important to him because he has concerns about toxic elements present in many Chinese-made goods. Let's take a look at 5 of the best-selling options and see how they compare. 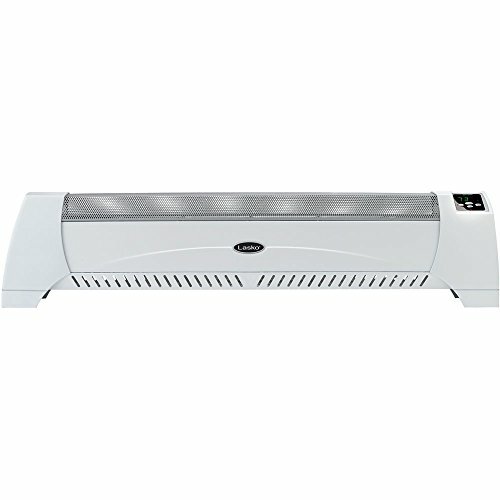 The 12 lb, 7.5” x 45” x 5.5” Fahrenheat FBE15002 Electric Baseboard Heater is a good option that has two wattage settings (1000 W for low or 1500 W for high). Its users like that it can effectively heat up a small room, but also note that it produces a bad smell for the first hours of its operation. Its high-impact Lexan end panels have built-in handles. The thermostat has a power light with an attractive chimney fin element design. It is energy efficient and has a 120V operation. This dual-wattage portable heater is a nice option if you are looking for a good looking and efficient baseboard heater. Users of this heater generally concur that it works quite well in heating up dens, bedrooms, or basements. One user said that it takes about 30 minutes to warm up a 140 sq ft bedroom and that 2 units working every night cost only about $65 per month in electric bills. It is easy to use and operates quietly. On the negative side, a number of users complained about the smell that it produces for the first 6 or 10 hours of use, after which it dissipates and is not noticeable anymore. Also, the light does not turn off unless it is unplugged. The 11.5 lb, 48” x 4.6” x 7.2” King KP1210 Portable Baseboard Heater is a satisfactory option that uses a relatively low 1000 W of power. Its users like that it is great at supplementing heat in small rooms, but also note that some units start producing a low humming noise after some time of use, which can be distracting especially if used in a bedroom. It has an all aluminum design with a bright white finish. The thermostat is built-in, and a safety tip-over switch automatically cuts off the power if the heater accidentally overheats or falls. This baseboard heater is a fair option if you are looking for a simple and relatively low energy consumption supplementary heater. This product has received mixed reviews from users. On the one hand, some users love that it’s just what was needed to supplement the heat in small spaces. They also like that it can be operated simply and appears durable and sturdy. However, users who were not pleased with the product complained of a loud buzzing noise that it makes sporadically and lasts for 5 minutes or longer. Also, some think that the metal parts have some easily seen gaps between them, giving the unit a cheap look. The 10 lb, 39.7” x 5.4” x 9” Lasko 5622 Silent Room Heater is an economical option that has a digital thermostat and display. Its users like that it is quiet and heats up a small area quickly, but there have been some complaints on certain units that stopped working after a few months. It is made of metal that is painted with a neutral color to blend easily with any decor. Safety features include a tip-over safety switch and automatic overheat protection. It uses 1500 W and the adjustable thermostat ranges reaches up to 85 degrees F. A built-in timer can be set to automatically turn off the heater after a period of time (1 to 8 hours). This room heater is a considerable option if you are looking for a competitively priced portable baseboard heater with digital controls. Users of this product are split in the middle — those who are very pleased and those who are extremely disappointed. The former group love that the product works as advertised, is silent, and produces a lot of heat. On the other hand, unhappy users typically have defective units that stop functioning after a few days or months of use. The 12 lb., 60” x 5” x 7” King Electric KP1215-ECO Dual-wattage Portable Baseboard Heater is a good option that automatically uses the lowest wattage required to heat the room, reducing energy consumption. Its users love its efficiency, but also note that the material used for construction may easily get dented. 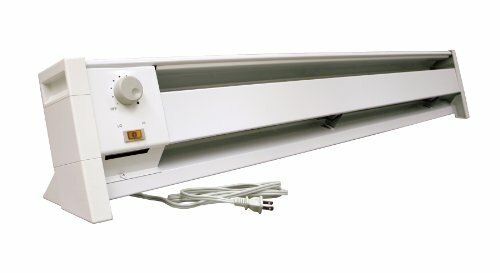 It switches between 1500 W and 750 W depending on the temperature requirements of the room. In a cold room, it utilizes full power to heat a room quickly. Once the desired temperature is achieved, the heater automatically reduces the wattage to maintain the room temperature. It has a lighted on/off power switch and two eco-indicating lights. It has a convenient carry handle at the back and is designed with rounded corners and wide base feet for stability. An all angle tip-over switch is built-in for safety. This portable area heater is a viable option if you are looking for an energy-efficient baseboard heater. Users of this portable heater are generally happy about their purchase. They like that it works very well to provide comfortable levels of heating at home and even in offices. They also enjoy its energy efficiency and portability. However, one user said that the body of the unit gets dented a little too easily, damaging its appearance. The 8.8 lb., 30” x 6.2” x 10.8” Comfort Zone Low Profile Baseboard Heater CZ600 is a very affordable option that is compact and lightweight. Its users love that it is very quiet, but also note that the knobs look and feel a bit cheap, but work fine. It features a heavy gauge heating element for silent even heating in a contemporary style. The 3 position rotary switch chooses between High (1500 W), Low (750 W) and Off settings. An adjustable thermostat makes this heater easy to control. Safety features include a tip-over cut-off switch, an overheat protection system, a power indicator light, and stay-cool high impact side panels. 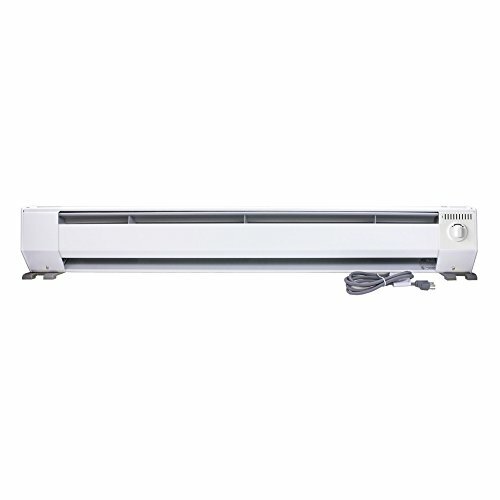 This baseboard heater is a great option if you are looking for an inexpensive and quiet heater. The general consensus among users of this product is that it is really very quiet and effective at putting out the heat. One user said that the low setting was enough to keep their room quite warm, and another said that it heats up a 40 sq ft room with ease. As we have seen, there are a variety of quality baseboard heater options available on the market today. Many buyers search them out at Lowes, Target, Home Depot and even Costco- with other savvy purchasers looking for the best prices online. It's important to note that many of these baseboard heaters are portable, which means they can be moved from room to room in your home, and just plugged in to 120 V outlets where needed to generate heat. There are also hard-wired baseboard heaters that are meant to be permanently installed in a room, and generally they come in 120 V as well as 240 V options. The ones that we have examined are all portable baseboard heaters- so they are easy to position in a bedroom and then be unplugged and moved to a living room, the many times users will purchase several of these baseboard heaters at a time. Our second pick would be the Lasko heater- users say that it is 100% silent, without any of the buzzing or creaking noises that sometimes plague similar units. One user does complain that it doesn't sit on the floor evenly- this was not a big deal, all he did to fix it was tape some cardboard beneath one of the feet to even it out. Another user whose central heating failed him during the cold winter ended up purchasing a couple of these baseboard heaters for his apartment, and he was particularly pleased with their strength as well as the timer settings that allowed him to calibrate when the heaters turned on and off. Overall, these baseboard heaters can provide a useful warming supplementation. Perhaps helping out because your radiator doesn't provide enough coverage to all areas of your home, or perhaps your central heating has failed and you're looking for a handy and portable solution until it's fixed. Some users even purchase it to install near a drafty window to ensure that the house isn't chilled by cold outside air!